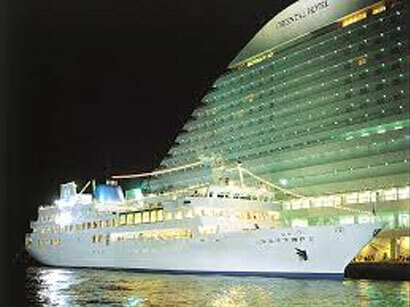 Luminous Kobe 2 is one of Japan’s largest restaurant cruise ships at 4,778 tons gross and total length of 106 meters. Its day cruise will impress you with Kobe’s cityscape and the view of Kobe Airport and the scenic Rokko mountains, and the night cruise will steal your hearts with the illuminated Akashi Kaikyo Bridge and Kobe’s million dollar view of its night skyline. We offer the chef’s special Mediterranean-style French cuisine using ample seasonal ingredients as well as a steak buffet grilled by the chef right in front of your eyes. – Adult (12 years old or over), children (6 to 11 years old). Up to one infant may board free per one adult. – Service will be suspended between late December to mid January due to routine inspection. – Depending on the weather and maritime conditions of the day, the course may be changed or suspended. Further, since the ship may become full due to group bookings etc., please confirm the operation status before boarding. – Various credit cards are accepted. – Approx. 20-minute walk or 5-minute taxi ride from JR Motomachi Station, Hanshin Motomachi Station and Hankyu Hanakuma Station.- Approx. 10-minute taxi ride from JR Sannomiya Station, Hankyu Kobe-Sannomiya Station and Hanshin Kobe-Sannomiya Station. Approx. 5-minute walk after getting off at Nakatottei on #90 Kobe City Bus.There is a City Loop Bus depot in front of Kobe Port Tower.- Approx. 15-minute taxi ride from Shin-Kobe Station on Shinkansen Line.- Approx. 8-minute walk from Minato Motomachi Station on Subway Kaigan Line.- Approx. 20-minute walk or 5-minute taxi ride from JR Kobe Station.For guests flying into Kobe- Approx. 15-minute taxi ride from Kobe Airport.- Approx. 16-minute ride on Port Liner from Kobe Airport Station to Sannomiya Station.- Approx. 70-minute bus ride from Kansai International Airport(KIX) to JR Sannomiya Station.Ticket Office / Terminals- Please board after purchasing the boarding fare at the ticket counter in Nakatottei Passenger Terminal (Kobe Meriken Park Oriental Hotel 2F).